Several weeks ago, I entertained my granddaughter while my son and daughter-in-law did some yard work. When I heard commotion in the carport, I went to investigate. My son had moved a large rug that was rolled up and standing on end. Last year, a bird built a nest on top of the rug. However, my son didn’t realize another bird family had moved in this year. When he moved the rug, and the nest came down, baby birds landed everywhere, and an upset mama bird made her displeasure known. We watched as the mama bird went to work. In a short amount of time she had regrouped, literally, moving each of her babies to the opposite side of the carport and corralling them in a corner. Often, a comfortable existence is upset in the same manner as this toppled nest. You have everything arranged, just so. Your plans are in place, when suddenly the rug is pulled out from under you. A job you like and planned to have until retirement abruptly ends. A promotion you’d been assured would come your way goes to another. An endeavor you are confident about is repeatedly rejected. Plans you’ve made for your family are upset by conflicting schedules. An unexpected diagnosis changes every aspect of your life. As a writer, I’ve watched many publications and publishers come and go. Outlets for which I wrote for many years suddenly disappeared. Conferences where I once taught changed leadership and others were invited to teach. Open doors closed. These changes caused me to rethink and stretch and analyze and search, none of which were comfortable. However, the process helped me hone my writing niches, look for new writing opportunities, attend and teach at other conferences, and more clearly define my writing style and voice. It’s easy to grow complacent in a situation that is stable, but not necessarily the best use of your skills and talents. Change is never easy or comfortable, but if you can look beyond the uncertainty and discomfort, you will catch a glimpse of fresh ideas, different opportunities, and a new path forward. If you’ve ever watched trees in a severe storm, you know those with the most flexibility are the ones that bend, but do not break. The same is true in life. Your ability to remain flexible helps you survive challenging circumstances and change without irreparable damage. If you sulk, complain, and feel sorry for yourself when changes happen, you’re likely to lose momentum and fail to move ahead to the next opportunity or phase of life. The mama bird who had the rug pulled out from under her well-constructed nest was suddenly plunged into reorganization mode. In order to keep her babies safe and alive, she had to act fast. She was aware her babies were at risk from potential predators. Although she did a good bit of what sounded like fussing, I believe she was instead shouting out reassurances to her children and encouraging them to move beyond fear to a new place. Don’t worry. I’m nearby and all will be well. When an event suddenly pulls the rug out from under your well-crafted plans, God is there, giving you the necessary wisdom to assess the situation, helping you analyze what has happened, and see potential in what lies ahead. If you are receptive, he draws you closer to him, shielding you from the predators of discouragement, fear, anger, and insecurity. 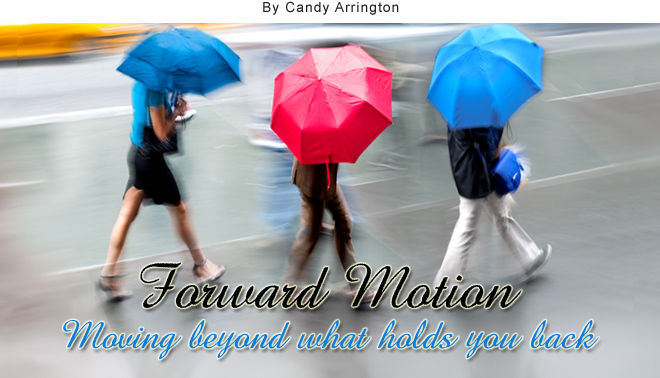 He helps you re-group on the opposite side of what has happened and maintain forward motion. Your job is to listen for His voice and trust. Flexibility helps you navigate life. Change is never easy or comfortable.